This sweet and tangy Simple Christmas Sangria is the perfect cocktail to bring to a holiday party; your friends will surely be impressed! Thanksgiving at my house has always been a big celebration. My mom, an excellent chef, works her hiney off in the kitchen for about three days straight, preparing an epic feast for the family. My relatives from Miami come into town, always bearing gifts of pastelitos (guava pastries), Cuban bread, papaya, and mango. We blare Christmas music, drink plenty of booze, and stuff our faces until we’re ready for bed. This night has always been the catalyst to the Christmas season. The balsam candles are whipped out from last year’s Bath and Body Works sale. Christmas music graces each of our Pandora or Spotify accounts. The lights are placed on the front yard shrubbery. We say ‘yes’ to a Christmas tree, take it home, let it sit for a day and then decorate. The most wonderful time of the year. Not to mention, my birthday is in mid-December. Double whammy! The night after Thanksgiving, we had a family dinner at my sister’s house. 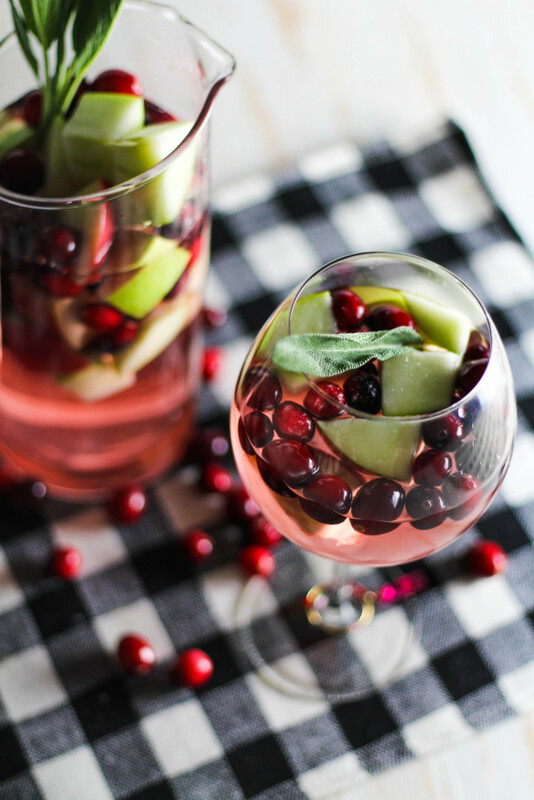 Not wanting to show up empty-handed, I crafted this sangria to match our holiday vibe. Not to mention, our cousin was in town from Spain, and I wanted to get her opinion on my sangria. Spoiler alert: she loved it! The mixture of cranberries and apples brings a marriage of sweet and tangy that will make your taste buds smile. The addition of cran-apple juice amplifies this combination, forming a well-rounded flavor profile when mixed with the crisp Pinot Grigio. 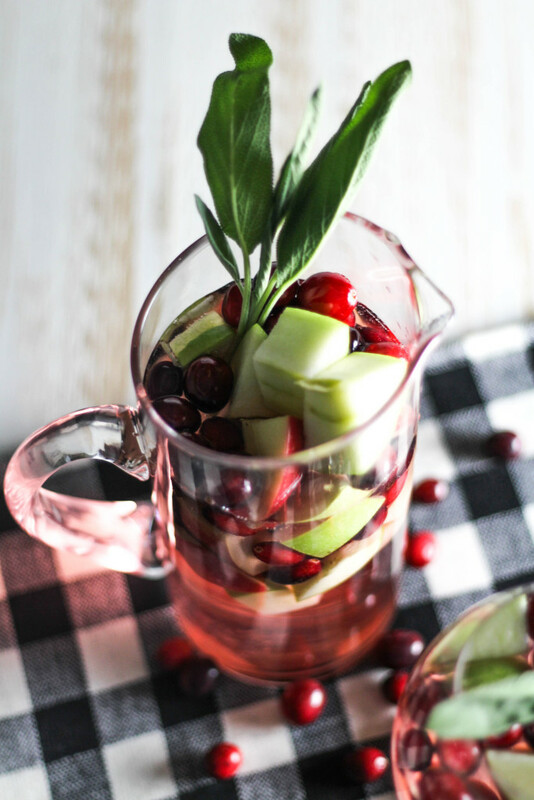 This Christmas sangria is super simple! What is your go-to holiday cocktail? What is Thanksgiving like in your house? Did you like this recipe? Pin it for later! I'm Christina. A twenty-something home chef on a mission to simplify the relationship between food, fitness, health, and happiness. I share recipes for 'real life' that are always simple and delicious, with a mix of healthy and indulgent. I hope you'll stick around on this journey to the 'blissful balance'! I LOVE this. My mom makes an alcoholic drink every Christmas for our family dinner and I think I might just have to convince her to make this one :). This might be the prettiest sangria I’ve ever seen. When in doubt, bring alcohol to holiday parties 😉 … but really. Pinning! Right!? So easy haha I feel like I’m cheating! I love the combination of sweet and sour and even better, this recipe is gorgeous. Perfect for the holidays! Girl. Giiirl. This looks absolutely fantastic. I love sangria, especially with white wine. Your thanksgiving sounds so lovely! I can only imagine the epicness of your feast. Thanksgiving was so nice this year! It wasn’t a huge group; there wasn’t too much food; and there was lots of great conversation, which was my favorite part…My favorite holiday cocktail is WINE…HAHA! I love a great conversation with a small group!! Sounds perfect. I’m obviously a fan! I love the addition of cranberries! I wish I could drink this…right.now. HAHA sending some your way!! My husband and I LOVE sangria! This festive concoction looks amazing too! the holidays at your house sound lovely! 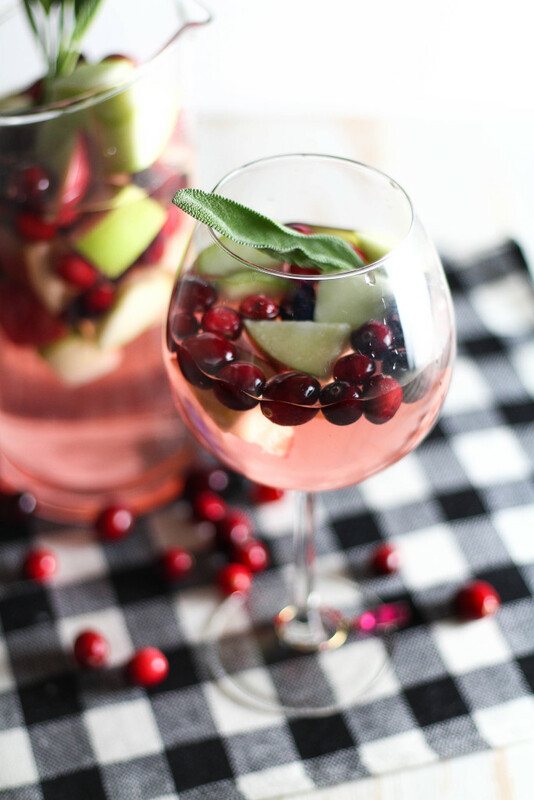 This sangria is almost too pretty to drink. ALMOST. As this has fruit it in, it would therefore be fine for breakfast as well, right ;D? This looks absolutely beautiful! What a delicious holiday treat! Thank you so much Rachel you’re so sweet! YUMMY! This looks so festive and fun! Love all the bright colors! Thanks for sharing! Cailee recently posted…Hello Healthy Holidays- How to Stay Active! Thanks so much, Cailee!! What’s your favorite cocktail?! I’m a sucker for fruity drinks. I saw this on your facebook page the other day and have been waiting for you to post where it was from, didn’t know it was yours. So excited to try it! Haha that’s funny! I hope you enjoy!! Oh the pictures are gorgeous. Will have to try the addition of sage with sangria, sounds wonderful! This looks so good, Christina! Last year at the beach, my friends and I made Sangria with La Croix every single night and it was SO good! No hangovers either! I’ve never had sage in a sangria I bet it amazing! I LOVE sangria. Yes, it’s typical white girl, but I swear this stuff is so good! I think it makes it more appealing when there’s fresh fruit involved in an alcoholic drink. Well anytime you add a good honeycrisp 😉 This looks so pretty! This looks absolutely delicious and I’m bookmarking this for Christmas Eve!! Love this sangria! It’s beautiful and delicious! I included it in my most recent post https://talesfromwalnutstreet.wordpress.com/2016/12/08/keeping-it-simple-for-the-holidays/. I hope you don’t mind! Thanks so much for the inspiration! Happy Holidays! Welcome to The Blissful Balance! I'm Christina: a twenty-something home chef and young professional on a mission to simplify the relationship between food, fitness, health, and happiness. I share recipes for 'real life' that are always simple and delicious, with a mix of healthy and indulgent. I hope you'll stick around on this journey to the 'blissful balance'! New posts every Monday, Wednesday, and Friday.